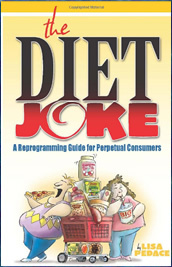 The Diet Joke: A reprogramming guide for perpetual consumers is written by Lisa Pedace, an actress and comic. Pedace points out that she is not a celebrity or a doctor and has no qualifications other than successfully managing her weight for many years. This book is a humorous exploration of the diet industry as well as a common sense guide to losing weight. Pedace says that diets are a joke because they have turned us into a culture that is obsessed with weight loss while at the same time we live in a society where we are constantly encouraged to “consume everything in sight”. The fundamental concept of the book is that if you are going to be successful in losing weight then you need to change your lifestyle. Pedace warns dieters to avoid being drawn into the idea of “Weight Loss Fantasyland” where dieters are promised easy, permanent and guaranteed results with minimum effort. With an element of humor she shows readers how to tell if they have developed “SUCKER disorder” for which her remedy is shock treatment, the shock being the realization that you will never be able to lose weight permanently unless you change the way you eat permanently. The Diet Joke recommends getting back to the basics of eating less and exercising more. To help dieters achieve this goal Pedace includes many “reprogramming activities” that will help you to question your beliefs about dieting and learn to incorporate healthy habits into your lifestyle. The book includes three major sections that each contain three chapters. Part 1 is called “About Us” and explores how we are influenced by advertising and also discusses obesity statistics. Part 2 is called “About Food” and goes into basic information about calories, nutrition and the food pyramid. Part 3 is called “Beyond Food” and covers exercise, emotions, body image and the factors involved in maintaining a healthy lifestyle. Throughout the Diet Joke, Pedace intersperses humor with practical information and down to earth advice. Her general dietary recommendations are to monitor calorie intake and portion sizes while following the USDA food pyramid guidelines. Whole grains, vegetables, fruit, dairy products, meat, fish, poultry, eggs, beans, nuts, seeds, tofu, healthy fats. The Diet Joke does not include a meal plan but the following menu is in line with general USDA recommendations. The Diet Joke advises readers to exercise in accordance with the CDC recommendations, which involves between 30 to 45 minutes of moderate intensity aerobic activity five times a week. The Diet Joke retails at $14.95. Focus is on making permanent lifestyle changes. Provides dieters with practical tools. Humorous and easy to read. Increases awareness about the calories in fast foods. Does not provide a meal plan or recipes. Requires calorie counting or monitoring portions. Does not contain any particularly new information. While The Diet Joke takes a humorous look at dieting it is also filled with common sense advice and practical information. It manages to address the issues surrounding dieting and weight loss in an entertaining way while still conveying the important factors involved in successful weight management. The major strength of The Diet Joke is the reprogramming activities that help to increase awareness and reinforce the concepts conveyed in each chapter so that they can result in positive lifestyle changes.